Put your Spurs knowledge to the test with Tottenham FC Quiz. The only app dedicated to the mighty Hotspurs. Compare your skills with fans from around the globe with the single player’s Game Center leaderboards or compete locally with either the pass & play mode or the buzz in game which are available as in app purchases. This game includes 50 questions to give you a taste of the challenge and another two packs are already available to download from launch. In the single player game you answer as many questions as you can before running out of lives. You have 3 lives, one deducted for each wrong answer, and 3 skips which are accessed by swiping left over the screen. As always you have 15 seconds per question and if you run out of time on a question its game over. You get 3 points for answering within the first 5 seconds, 2 for answering within 10 and 1 if you answer within 15. This mode is for when you’re sitting with a fellow supporter at your side. The player sitting to the left of the device is the home team, and the player sitting to the right is the away team. You’ll be shown 15 questions and players need to buzz in to answer. You buzz in by pressing your half of the screen on the iPhone or the buzzer buttons if you’re playing on the iPad. Once you’ve buzzed the buttons change to your colour, to show you have control and can select an answer. If you’re correct you get up to 3 points, as with the single player mode, but you will lose 3 if you’re wrong. If neither player knows the answer you can skip the question by swiping left, providing nobody’s buzzed in. This is a two player mode where players take it in turns to answer questions. You play best of three rounds, with three questions for each player in each round. Home team starts first, in the event of a draw at the end of a round, the fastest player wins. The points system is the same as the single player round. 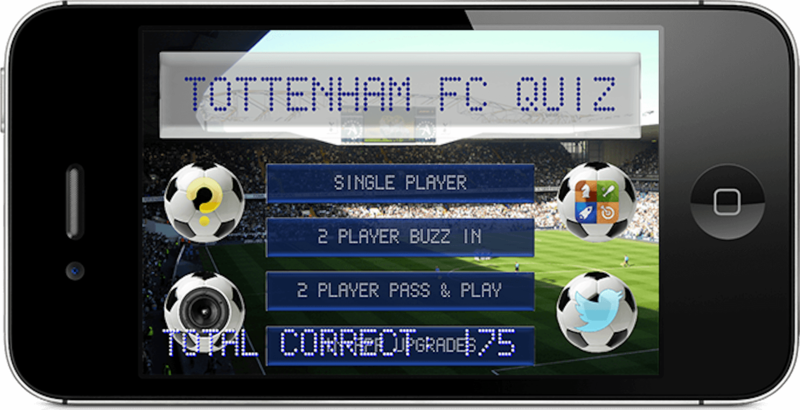 Note: The Spurs Quiz is not affiliated with Tottenham Hotspurs. This app is not an official Tottenham Hotspurs product.